The musculature of the rotator cuff is responsible for synchronous movement of the shoulder. Without proper training, these muscle weaken and easily fatigue. This leads to an imbalance of the shoulder which can cause dysfunction and pain. Each of these exercises should be performed slowly. Never go beyond your tolerance for pain. keep the arc of movement within a pain free range. Start with the unaffected or less affected side to learn the movement pattern. Perform each exercise 10 to 15 times per side. Daily workouts during the rehabilitative phase will produce better results. Use a light resistance elastic cable. At first one can modify the demonstrated movement pattern until the shoulder becomes stable then a closer adherence to the demonstrated activity will produce superior rersults. This exercise uses a high cable as shown in the photograph to the right. Start with the arm extended as far as a pain free movement will permit (fig. A). 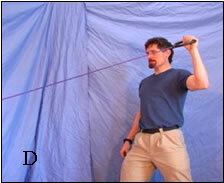 With a straight arm, slowly pull the cable handle to your side or as far as pain will permit (fig. B). SLOWLY return to the starting position. Repeat a total of 10-15 times then switch to the affected side and repeat. Be sure to place the leg opposite the shoulder being exercised forward as demonstrated. Then support your back by placing the free hand on the thigh as shown in figure A. Doing this will help stabilize and support the lower back. The elbow locked in open position. The movement comes from shoulder. Control the movement in both directions. Keep the movement pain free. Place opposite side foot forward. Brace lower back with hand on thigh. Perform 10 - 15 repititions per set. 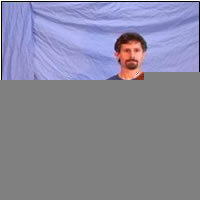 This exercise uses a cable which is attached to a stationary structure which is placed about chest height as shown in the photograph to the right. Start with the arm extended 90 degrees from the body or as far as a pain free movement will permit (fig C). With the elbow bent to 90 degrees slowly pull the cable handle back until the arm is parallel to your body or as far as pain will permit (fig. D). SLOWLY return to the starting position. NOTICE: THE ELBOW DOES NOT MOVE. All motion should come from rotation of the humerus (upper arm bone). Repeat a total of 10-15 times then switch to the affected side and repeat. Exercise the un-affected shoulder first. The elbow should be level with the shoulder. The elbow does not move during exercise. Place opposite side foot forward for stability. 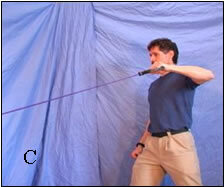 This exercise uses a chest to shoulder high cable as shown in the photograph to the left. Start with the arm extended 90 degrees from the body or as far as a pain free movement will permit (fig. A). With the elbow bent to 90 degrees slowly pull the cable handle forward until the arm is perpendicular to your body or as far as pain will permit (fig B). SLOWLY return to the starting position. NOTICE: THE ELBOW DOES NOT MOVE. All motion should come from rotation of the humerus (upper arm bone). Repeat a total of 10-15 times then switch to the affected side and repeat. 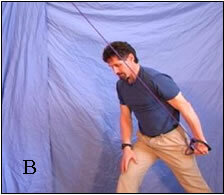 This exercise uses a waist to chest high cable as shown in the photographs to the right. Start with the arm held across the body with the elbow bent to 90 degrees and braced against the abdominal area (fig. D). Slowly pull the cable handle across the body as far as pain will permit (fig. C). SLOWLY return to the starting position. NOTICE: THE ELBOW DOES NOT MOVE. All motion should come from rotation of the humerus (upper arm bone). Repeat a total of 10-15 times then switch to the affected side and repeat. Place same side foot forward for stability. 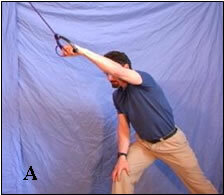 This exercise uses a waist to chest high cable as shown in the photograph to the right. Start with the arm held away the body with the elbow bent to 90 degrees and braced against the abdominal area (fig. F). Slowly pull the cable handle back across the body as far as pain will permit (fig E). SLOWLY return to the starting position. NOTICE: THE ELBOW DOES NOT MOVE. All motion should come from rotation of the humerus (upper arm bone). Repeat a total of 10-15 times then switch to the affected side and repeat. Exercise the un-affected side first.